Members of the organising team pose with permanent secretary to the Ministry of Tourism, Arts, Culture, Youth and Sports Datu Ik Pahon Joyik (second right) to promote the event. KUCHING: An event called ‘Sarawak Adventure Challenge: The Lost Mines’ will be staged in Bau on Oct 14. 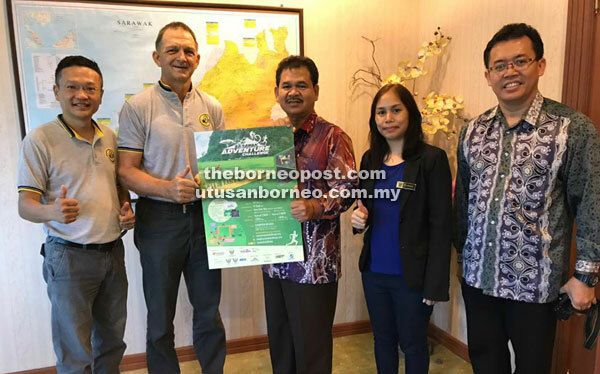 According to organisers, the inaugural event aims to deliver on Sarawak Tourism’s marketing tagline ‘Where Adventure Lives’ and gives participants a chance to live the adventure. The international multi-sport adventure event will include a combination of mountain biking, trail running as well as a cave run – evoking images of ‘Indiana Jones – The Lost Mines’ theme, a reference to the area’s colourful mining history and the fact that the race will incorporate some of these features. “This international event has already attracted the attention of a number of top-ranked regional teams and about 150 participants are expected this year. “The event is supported by the Sarawak Government through the Ministry of Tourism, Arts, Culture, Youth and Sports, Sarawak Tourism Board, Tasik Biru (N2) and Serembu (N18) constituencies and Bau District Council. It is endorsed by Tourism Malaysia,” said the press release. There will be two entry categories; men’s open team and a mixed team with RM6,000 for first prize in each category. Cash prizes will also be given to each of the top 14 placing in each category. Registration is now open at www.sarawakchallenge.com and for more information regarding the challenge, call JC Chua (012-8979068).